You've been shang-hai-ed by the worst pirate crew ever to haunt the Seven Seas and all the other salad dressings put together! As we sail into deeper water, you lily-livered rusty scuppers can join in our pirate festivities, until it’s time for you to walk the plank! Songs, skits, feasting, frivolity, and a rousing game of “Who Wants to be a Buccaneer?” will have you “yo-ho-ho-ing” with the heartiest of us! You'll be swearing like sailor and laughing like a school girl by the end of the evening! ...or else we'll be using yer guts as garters!! 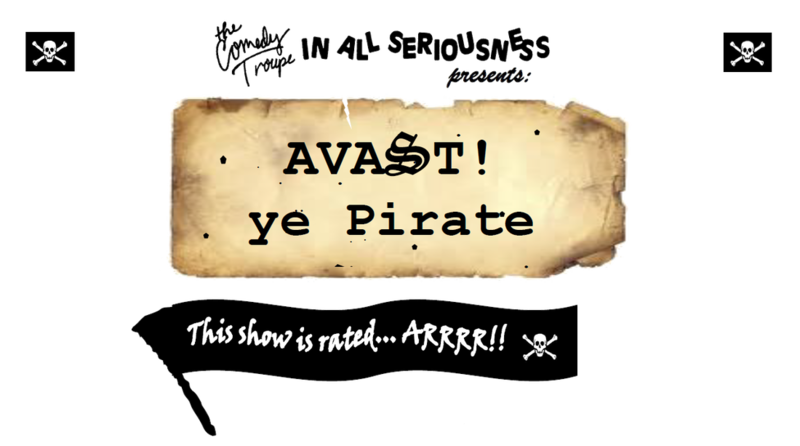 "I've been getting nothing but positive feedback about the [Avast!] last weekend -- people are already asking when we will do it again! Your group of pirate characters were really funny." "Interweaving aspects of our business along with some of your most colorful personalities shows how versatile and imaginative your group is. The laughter continues as we think about and retell portions of your performance"